The main difference between JVM and CLR is that the JVM is a virtual machine that is used to execute Java bytecodes while the CLR is a virtual machine that manages the execution of .NET programs. JVM or Java Virtual Machine allows executing the bytecode, which is generated by compiling a Java source code. It is available in many hardware and software platforms. In other words, JVM is platform dependent. On the other hand, CLR or Common Language Runtime provides the environment to execute programs written in .NET framework. It also provides additional services including type safety, exception handling, garbage collection, thread management and security. A Java program is a set of instructions written in Java programming language. It provides instructions for the computer to perform a certain task. Furthermore, we call the program written by the programmer as the source code. This source code is readable and understandable by the programmer, but it is not understandable by the computer. When compiling a Java source code, the Java compiler converts that code into an intermediate code called a bytecode. Then, the JVM converts this bytecode to the machine code so that it can execute the task defined in the program. When converting the Java source code into bytecode, it is not written for the physical machine. It is written for the JVM. Therefore, the bytecode can be executed on any machine that has a JVM. Here, note that the bytecode is platform-independent while JVM is platform-dependent. CLR or Common Language Runtime is a virtual machine that provides a runtime environment for the .NET framework. Also, every version of the .NET framework consists of a CLR. 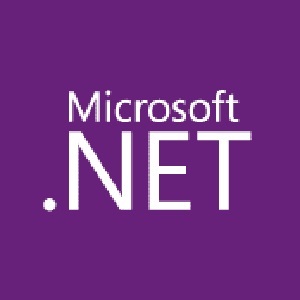 It can execute any program written in .NET framework regardless of the programming language. Besides, the programmer can write programs in the .NET framework in various languages such as C#, Visual Basic, and, F#. But, after the compilation, it generates an intermediate code called Microsoft Intermediate Language (MIL). Next, the Just-In-Compiler (JIT) compiles that intermediate code into machine code. Therefore, this final machine code is understandable by the computer, and it can perform the defined task. Meantime, the CLR provides multiple advantages. It provides cross-language integration, exception handling, enhanced security and deployment support. Additionally, CLR improves performance. Also, it provides a garbage collector to manage memory and make it easier to perform debugging. JVM is a virtual machine that enables a computer to run Java programs and to compile them to Java bytecode. CLR is a virtual machine of Microsoft .NET framework that manages the execution of .NET programs. Thus, this is the fundamental difference between JVM and CLR . 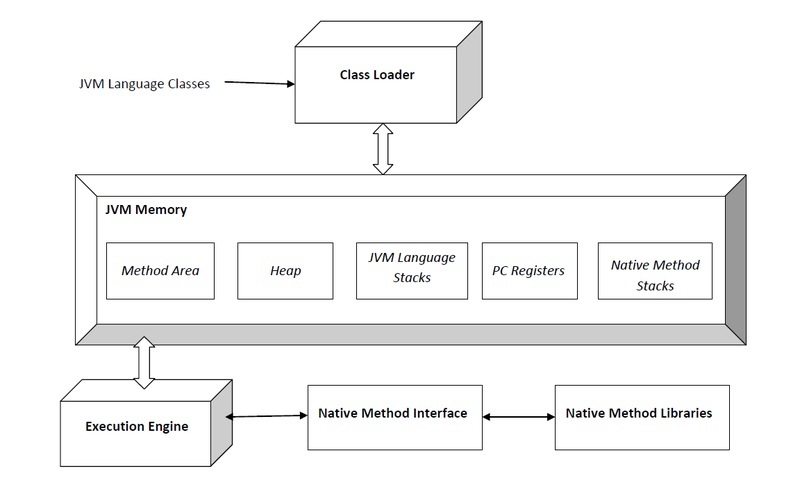 Moreover, JVM stands for Java Virtual Machine while CLR stands for Common Language Runtime. Also, the JVM associates with Java programming language whereas CLR associates with .NET framework. 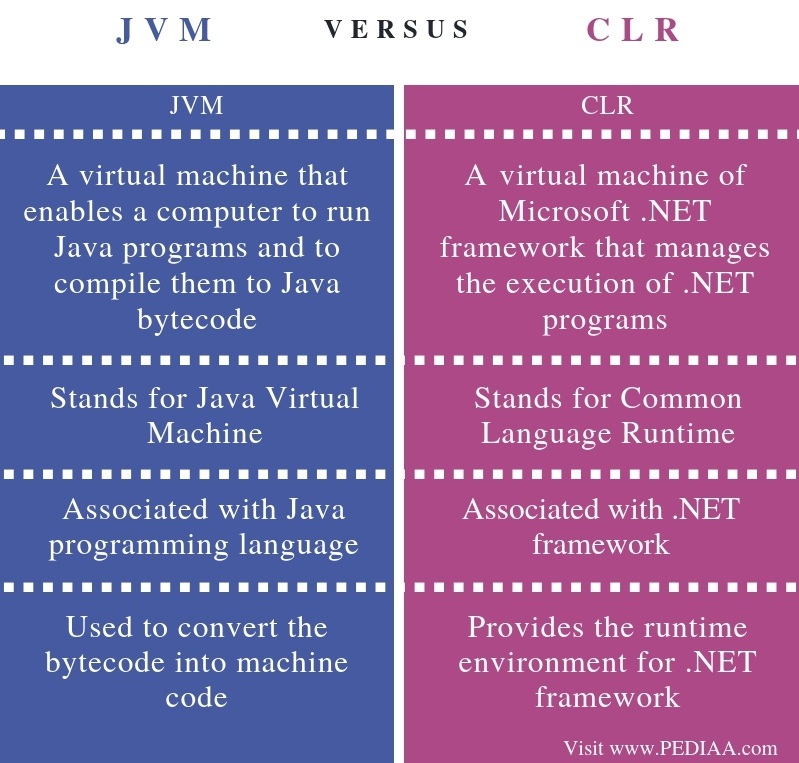 Another difference between JVM and CLR is that the JVM is used to convert the bytecode into machine code, but the CLR provides the runtime environment for .NET framework. JVM stands for Java Virtual Machine while CLR stands for Common Language Runtime. In brief, the difference between JVM and CLR is that the JVM is a virtual machine that executes Java bytecodes while the CLR is a virtual machine that manages the execution of .NET programs. 1. “Java Virtual Machine.” Wikipedia, Wikimedia Foundation, 29 Sept. 2018, Available here. 2. “.NET Framework – CLR”, Tutorials Point (India) Pvt. Ltd., 6 Dec. 2016, Available here. 3. “Common Language Runtime.” Wikipedia, Wikimedia Foundation, 5 Sept. 2018, Available here.